Des Moines New Baby Flowers: A Local Florist! Contact Us Today! Really there is nothing more joyful in life than the birth of a new baby and Wild Orchid Des Moines flower shop has such a great selection of new baby flowers and bouquets for the new parents in Des Moines. Send your best wishes and flowers to the happy parents in Des Moines with a beautiful new baby flower arrangement in Des Moines. We have a wide variety of new baby flowers and new baby gift baskets for parents in Des Moines. Whether you are looking for baby pink or baby blue or more modern styles of neutral baby colors, well we have all the choices of new baby Des Moines flowers. We also deliver new baby flowers to Des Moines hospitals as well. 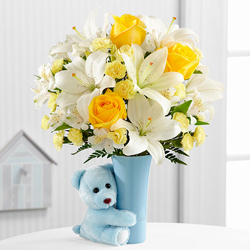 If you want to send the Des Moines new baby flowers before the birth, we can help you with that as well.